I saw this breathtaking jacket in Zara a week ago, and I have to admit, it was love at first sight! It's a beautiful medium wash studded denim jacket, with studs on the shoulders in the front as well as in the back, but when I saw the price I was heartbroken. It retails for 99,90$ which is not very cheap, and because I'm going to PARIS in a week I decided to save my money. But it doesn't leave my mind for a second, so I might pick it up in France anyway ;). I know it's probably not everybody's cup of tea but I'm totally fond of it. 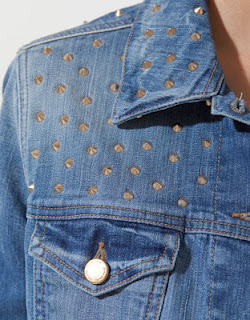 Would you wear this jacket or do you prefer the original denim jackets? How would you style it? Please let me know!